Despite the rainy weather (and I mean… really rainy) and impending arrival of Tropical Storm Hermine, we had a great day yesterday hosting our inaugural Geometric Dimensioning & Tolerancing (GD&T) Workshop. 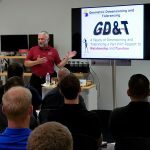 The first workshop in our new 3-Dimensional Learning Workshop Series, the free full-day GD&T Workshop featured industry expert Mark Foster, President of Applied Geometrics, Inc., and was sponsored by Zeiss Metrology. GD&T guru Foster led the morning session with an overview of the “what, when, why and how” of GD&T and the Y14.5 standard. He compared the ‘old’ methods of dimensioning and tolerancing to the Y14.5 approach, and discussed the many strengths and advantages of GD&T. Following lunch provided by Zeiss, the afternoon session took the theories presented in the morning into the real world of applications with a live demonstration of non-contact 3D scanning and use of GD&T in 3D modeling software. While it was far from the ideal weather day for a workshop, we couldn’t have asked for a better group of attendees who braved the elements to attend the GD&T workshop. And I would be remiss if I didn’t give a special shout out to Jon Waldman, the lucky winner in the Zeiss Binoculars drawing. Thank you to all those who attended and all the positive feedback. We are looking forward to hosting additional educational workshops on a variety of topics of interest to professionals involved in product design, manufacturing and inspection. 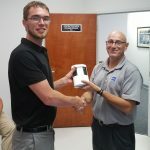 As we move forward with our 3-Dimensional Learning Workshop Series, we would love to hear if you are interested in attending a GD&T workshop in your area, as well as what other workshop topics you would like to see related to product development, inspection, reverse engineering and/or 3D technologies. Let us know!